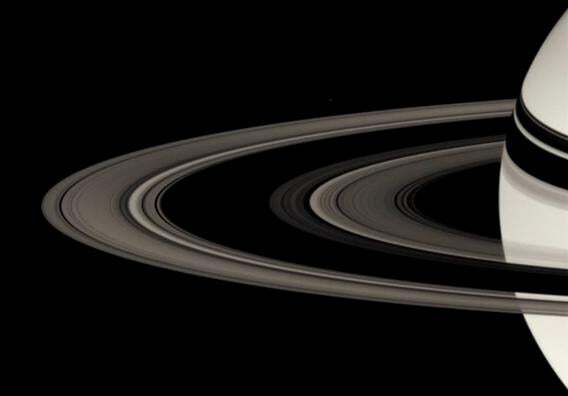 “Around Saturn”: A time-lapse video made from Cassini images of the ringed planet. Saturn and its breathtaking rings. Saturn’s a long way off, and it’s unlikely that anyone alive today will get to take a personal tour of the ringed wonder of our solar system. But we do currently have the Cassini spacecraft, which for the better part of a decade has been busily snapping away, taking hundreds of thousands of images of Saturn, its rings, and the bizarre retinue of moons orbiting it. Fabio di Donato is a consultant by day, but video editor by night. He took a huge number of those Cassini pictures and stitched together this engrossing and ebullient video, creating a virtual tour of Saturn for us Earthbound humans. I love the choice of music; I’m a big Shostakovich fan. But it does seem particularly fitting for the occasion. …and all throughout the video the rings are magnificent as we flip, twist, and turn our point of view, reflecting the spacecraft’s motion. Astonishing. Which part is your favorite? Can you figure out from the video just which moon or part of the ring you’re seeing? I was rather surprised with how much I know about Saturn from memory just from writing about it so many times; the names of moons sprung to mind pretty easily (though I double checked with some pictures online). Still, clearly, there’s a lot more to know. A lot. Saturn is at least a rich and varied environment as Earth, and perhaps far more. We could use a dozen Cassinis orbiting it. And a lot more videos like this to show their results to us. Tip o’ the dew shield to Jorge Flores on Twitter.